A manuscript nautical chart in the Museu de Marinha (Navy Museum) in Lisbon, Portugal, contains the earliest known depiction of lines of constant magnetic declination (isogones). The unsigned and undated chart represents the Philippine Sea and part of the Pacific Ocean. A series of curved lines graduated in points according to the value of the magnetic declination is arranged symmetrically in relation to the equator. Comparison of these lines with the spatial distribution of magnetic declination in the area in 1600, as given by the two modern geomagnetic models discussed below, suggests that this particular representation may reflect some observations made in situ, although with significant errors. Thus this chart predates by more than a century the printed isogonic chart of the Atlantic made by the English astronomer Edmond Halley in 1702, hitherto considered the earliest of its kind. According to Armando Cortesão and Avelino Teixeira da Mota, the first to study the chart, its attribution to the Portuguese cartographer Luís Teixeira presents no difficulty. Over the years the chart was reproduced by other authors, but no detailed study has ever been undertaken. As regards its date, the same authors thought that it might have been drawn c.1585. Although all the place-names on the chart are written in Portuguese, a legend gives Latin explanations of the abbreviations used on the chart. 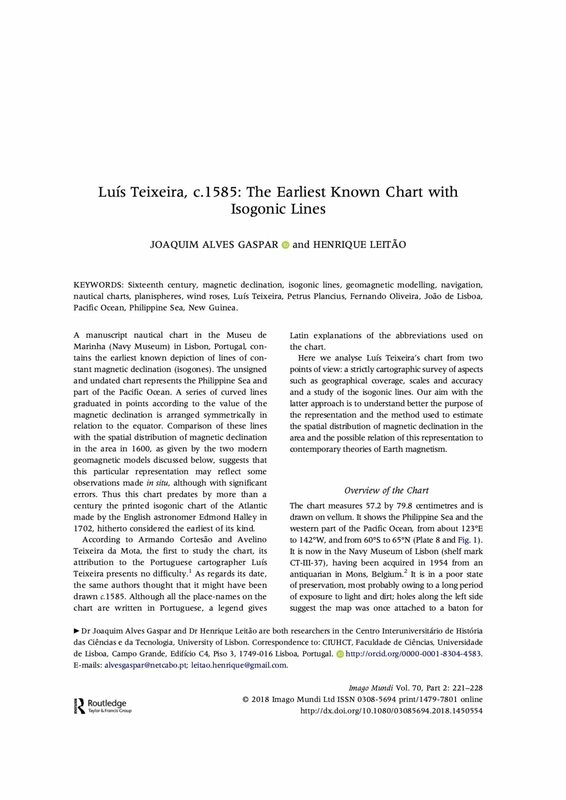 Here we analyse Luís Teixeira’s chart from two points of view: a strictly cartographic survey of aspects such as geographical coverage, scales and accuracy and a study of the isogonic lines. Our aim with the latter approach is to understand better the purpose of the representation and the method used to estimate the spatial distribution of magnetic declination in the area and the possible relation of this representation to contemporary theories of Earth magnetism.